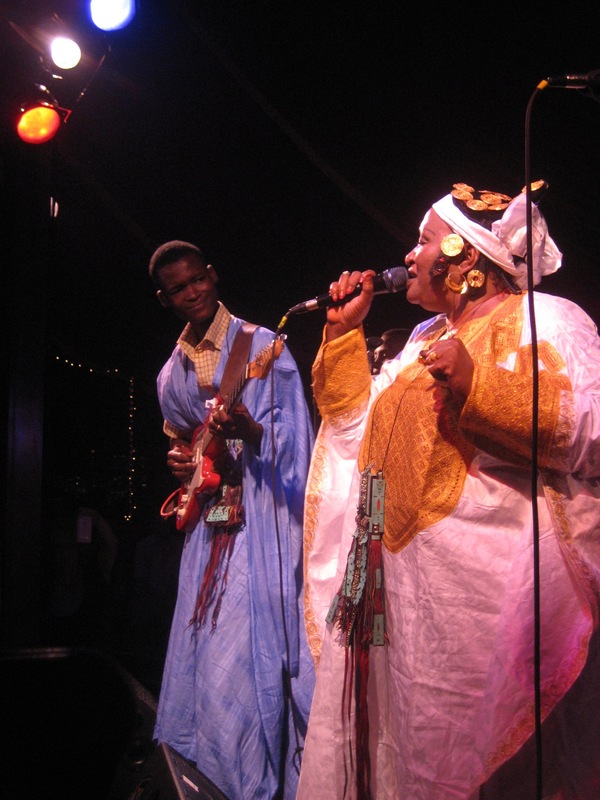 Two years ago, Hudson Valley radio DJ Raissa St. Pierre traveled all the way to Timbuktu to experience its annual Festival Au-Desert. 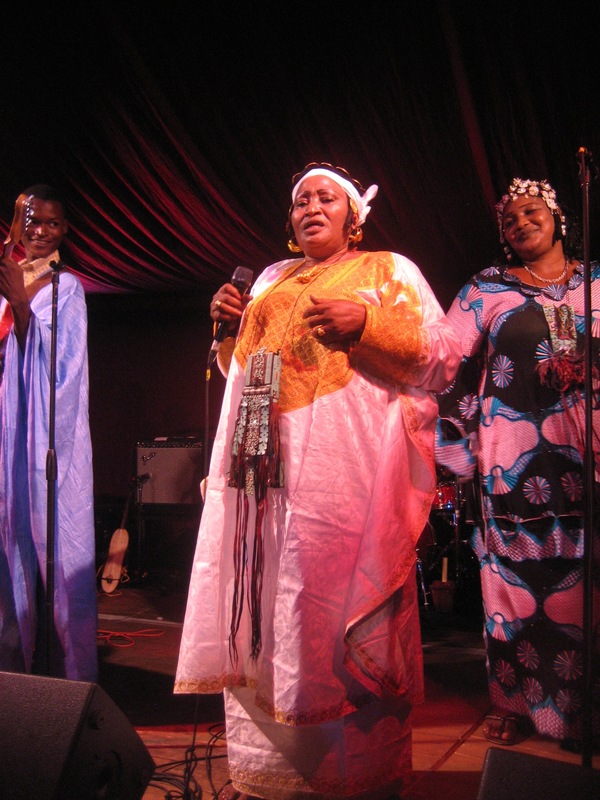 There she fell in love with the music of Mali’s own Khaira Arby. 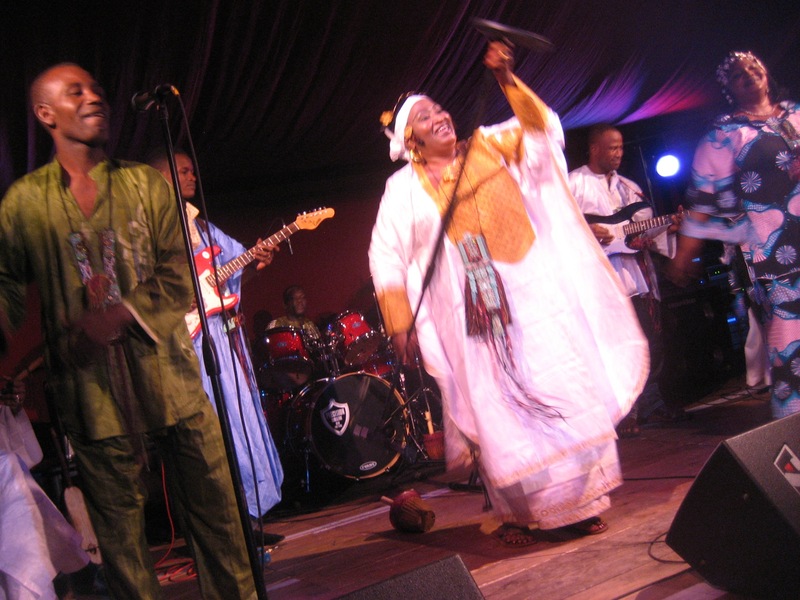 This past Thursday, August 12, the honor was returned when Arby and her 7-piece band played their first ever American concert at Bard College in Red Hook, Dutchess County, where St. Pierre promotes a Thursday night series in the amazing Spiegeltent for Bard’s SummerScape series. 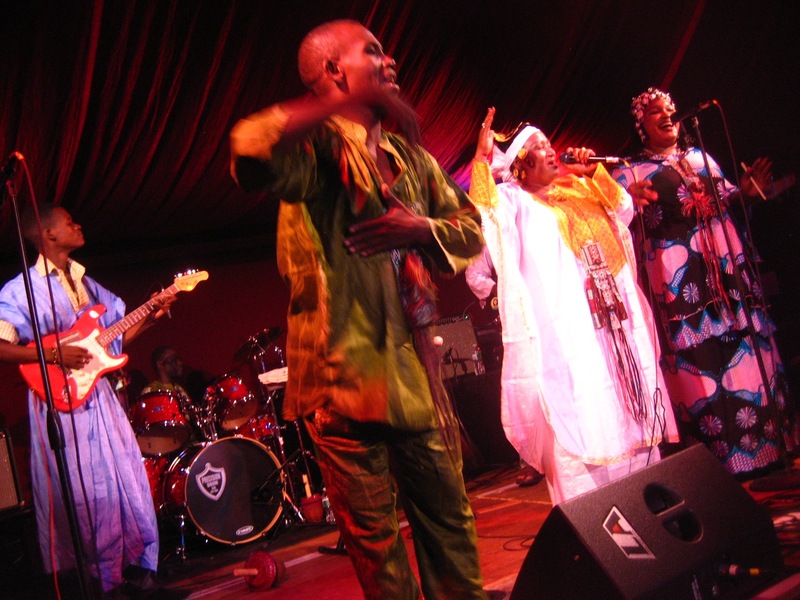 Adey Cisse, Khaira Arby and Diara Inne line the Spiegeltent stage, August 12, guitarist Barke Dembele in the background. 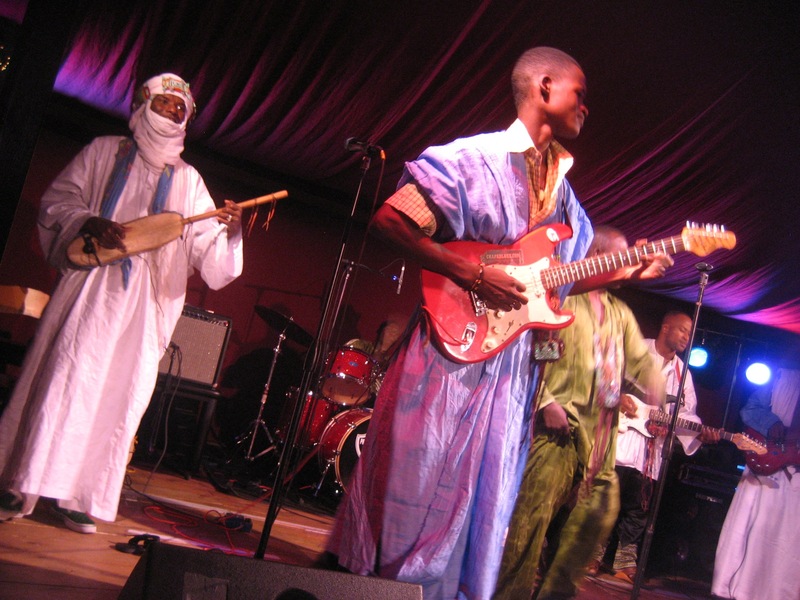 Arby’s music is a mix of tradition and modernity, with the stringed ngoni and calabash drum joined by trap drums, electric bass, and two electric guitarists, of which Abdrahman Toure’s lead work was particularly vibrant at the Spigeltent, his taut solo riffs based on the West African highlife music of neighboring Ghana yet distinct in its own right. All the group wore traditional clothing, two of the band in full desert garb (though this didn’t stop ngoni player Ebelaw Yattara from acknowledging my enthusiasm as I took pictures of him); a male dancer and occasional singer Adey Cisse, and backing vocalist/percussionist Diara Inna, each helped work the audience of all ages and many colors into an almost instant dancing frenzy. 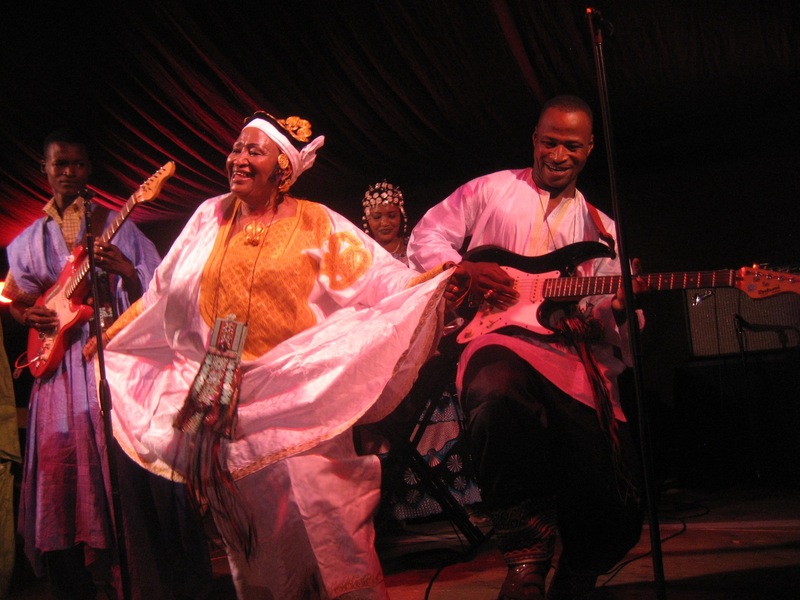 Center stage throughout was the effervescent and energetic Khaira Arby herself, singing what is widely referred to as “desert blues,” a music that is at times both secular and sacred, music that tells elaborate stories of family and folklore, but that also sings the praises of the prophets. Arby’s own story is one of relentless determination in the face of frequent adversity. 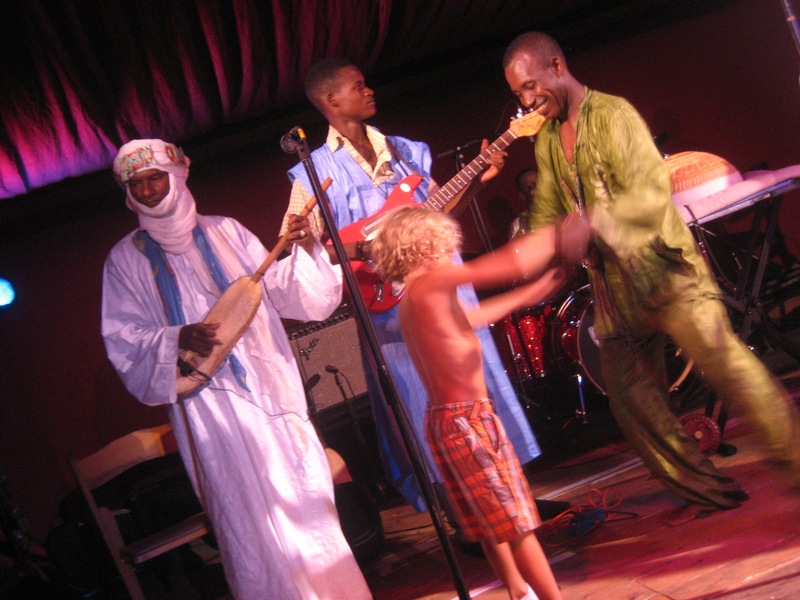 A native of the Timbuktu area, and a cousin of Mali’s heralded Ali Farke Toure, Arby was widely recognized as a talented singer in childhood, but rather than encourage this gift, her disapproving father married her off at the age of just 14. Eight years later, she successfully filed for divorce and resumed her singing career, embarking on a two-decade long journey to the forefront of her nation’s musical reputation. 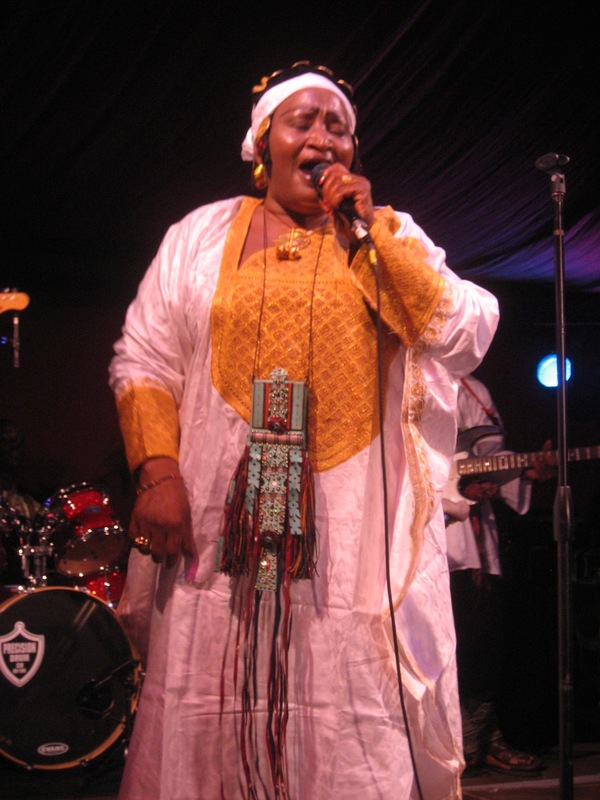 Indeed, in Mali she is regarded, and for all the word’s positive connotations, as a “diva.” (She is also, we learned on Thursday night, a newly proud grandmother of twins.) 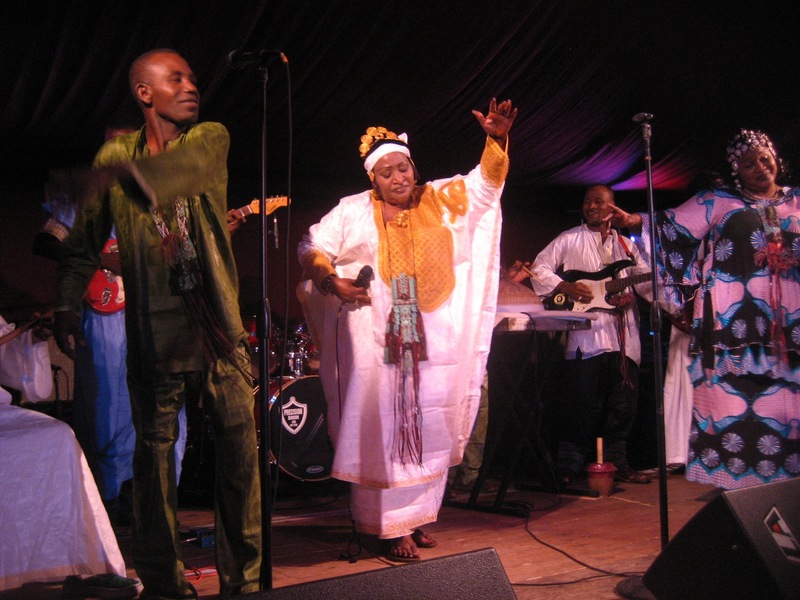 But though Arby has also carved out a strong following in African music’s European homeland of France (she spoke French to the audience at the Spiegeltent), until now her fame has spread no further. That should hopefully change with the international release of her fourth album, Timbuktu Tarab, by Clermont Music; you can hear some of it at Arby’s MySpace page, where her American tour dates are also listed, and where there are links to some enticing YouTube videos of her and her band in performance. 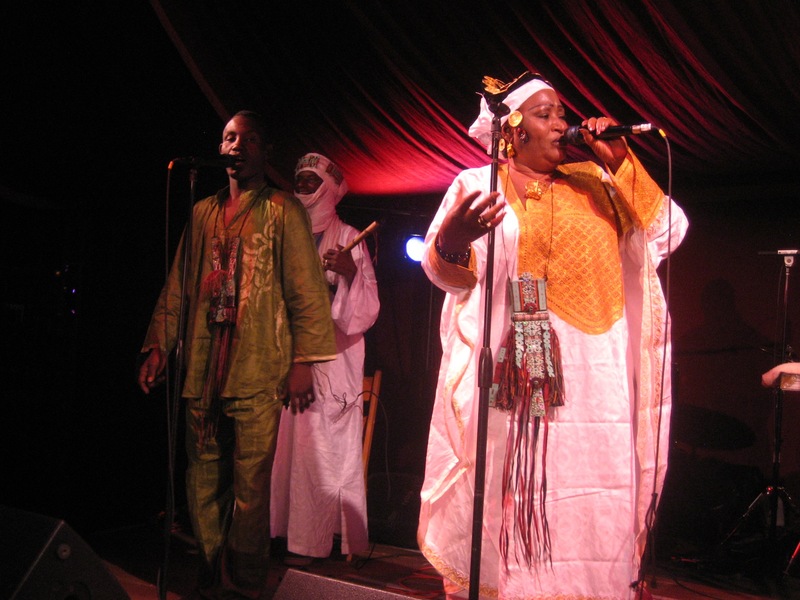 The set at the Spiegeltent was captivating but brief, certainly by African standards. I suspect that the gig was viewed as an informal warm-up of sorts for what will presumably be longer sets at venues that include both City Winery and Joe’s Pub in Manhattan, the Lotus and Global Roots Festivals in Bloomington and Minneapolis respectively, and a host of clubs, festivals and cultural centers in-between. Rest assured, should you take up the chance to see her and her group, that every minute is a thrill. Click on any of these images from the show at Bard to see them full size. (You may need to click through a second time.) Special thanks to SummerScape for keeping the ticket prices to an almost comically low $10, and for serving $4 glasses of Millbrook wine and $5 Magic Hat beers.